Currently the owners of pages can get some interesting stats about the gender and age of their fans via Facebook Insights, but one newly developed app could take it all a lot further and let you know – not just the age of your fans, but also how open they are, how happy they are, and how smart they are – a treasure trove of personality data all based on publicly available information. 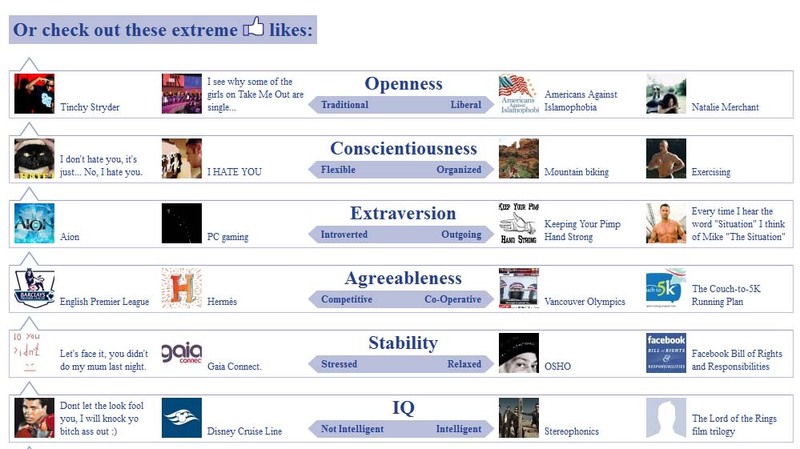 Like Audience is a Facebook app developed by the psychometric centre at the University of Cambridge and it uses the pages you like (always publically available) to deduce what your personality is like along certain scales used in personality analysis. For example, if you like Barack Obama – you are more likely to score highly on the “Openess” scale. If you like Tinchy Stryder you’re more likely to be traditional (don’t ask me why). If you like “Disney Cruise Lines” you are likely to have a relatively low IQ compared to someone who likes “The Lord of the Rings” triology. People who like Jennifer Hudson are very likely to be unhappy, while people who like “I hate Mosquitos” are happy – go figure. Currently the sample sizes are small so it’s far from perfect. Like Audience extrapolate out from a sample of people they do have full access to, and then work out the typical personality for the people who like a certain page, guessing that other people who like that page have similar characteristics. Sample sizes, and so accuracy of the app should increase, especially after they have partnered up with Facebook personality quiz app myIQ and myPersonality. Go on and check it out. You can search by page, and also set the personality parameters to find, for example, what older, smart liberal women like (Wuthering Heights) or what younger conservative single men like (The Indian Premier League and Coke Studio, for example). NB: not all pages are registered yet, so only the larger ones are available. It’s a treasure trove of information from an advertisers point of view, but it’s also really interesting just for the amateur psychology of it. As ever – there is so much information about the world on Facebook that any apps that manage to harness and organise it often turn in really fascinating gems. This is smart because it manages to make a lot out of the publicly available data so no privacy issues are raised. Also because it looks at the inter-relations between data – eg: people who like Edgar Allen Poe are more likely to like DeviantArt and so on, and the conclusions that can be drawn from that as opposed to just vertical data about one particular thing.